The flavors of pesto mix and mingle into a salad. For a meal, serve with chicken or fish drizzled with the Lemon Vinaigrette. Prepare Lemon Vinaigrette; set aside. Preheat oven to 425 degrees F. Split baguette in half horizontally. In small bowl combine olive oil and garlic. Brush onto cut sides of baguette. Cut each bread piece lengthwise into 3 or 4 breadsticks. Place on baking sheet. Bake 3 to 5 minutes or until toasted. Transfer to wire rack; cool. In large bowl combine lettuce and basil. 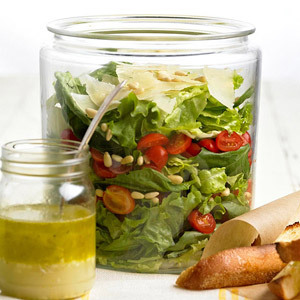 In 3- to 4-quart glass canister or desired container layer greens, tomatoes, pine nuts, and cheese . Serve with breadsticks and Lemon Vinaigrette. Makes 6 servings. * Cut the whole baguette in half crosswise. In small screw-top jar combine olive oil, lemon peel, lemon juice, garlic, sugar, salt, and ground black pepper. Cover; shake well.